This is the guild I belong to. I spent a good portion of this past weekend there and loved it all. I took A LOT of my fabric and notions that I just didn't need any longer to the Country Store. I took 10 of my quilts that I thought could go to a new home and sold all but one. The one that didn't sell was the one I wasn't sure I wanted to sell, so that worked out for me. So besides of narrowing down my stash, I also made a few dollars with which I can go buy more fabric. Or maybe Christmas presents. We will see which wins out. I have my bets on the fabric. I took a new camera (to me) to take pictures of the quilts. I went just before close Sunday so I could get pictures without lots of people. The sun was coming through the windows, so the lighting was very bright. I just didn't take very good pictures. I apologize. The guild has posted pictures to their Facebook page at https://www.facebook.com/rivercityquiltersguild. Please go there to see what they posted. They are far better than the pics I got. The one above is probably the one in the show that I would love to own. I walked in and thought I love the colors. I love the design. I want it for my bed. Very nice. Nice white basket quilt. I love basket quilts. I probably will never make one, but I love the look of them. The above quilt is a smaller one and in the picture, it really shows it off. When I walked up to it, I thought what is it. I was too close. When I went back to take pictures, I stood back and the design really popped out. The quilt is very simple. It is the quilting that makes this quilt. Love it. This has a blast of sunlight coming in the from the window. I tried several shots and this is the best that came out. This quilt was made with woven fabrics and is absolutely stunning. I started to crop this down to see just the white quilt, but I liked the setting and the quilt behind it showing up. Very nice. I love applique. This quilt is beautiful. This quilt was made by a lady that taught in my quilt store when it was open. She is a designer and does beautiful work. Laurel Anderson. Very nice, Laurel. New York Beauty. I am in the process of finishing New York Beauty blocks. I really like how this one was set and may use it as a pattern for when I get ready to put mine together. Very colorful. Well done. The above is truly magnificent. It is a quilt. A quilt that is framed in wood and looks like a cross cut of a tree. I went up close and it still looked like a tree. I had to ask my daughter, Elisa, to come and tell me if it was wood or fabric. I thought my eyes were playing tricks on me. Unbelieveable. The picture above is a challenge quilt submitted to the guild in October. The theme for the challenge was Yesterday, Today and Tomorrow. This quilt, with its pictures, represents it well. I love this quilt. It is a great historic quilt that could be passed down to progency for years to come. I think this was another Laurel Anderson quilt. If it isn't, I apologize. I love the cat going outside. The flowers were done in 3-D. Very nice. This is a small quilt done in an art group. The theme was houses. They were to make houses of any kind. I took another picture of them all, but it was very blurry. Too bad because each house told a story. The above one was my favorite, though. It is a two story outhouse. I would definitely hate to be the one on the bottom story. Too cute. One of the quilts I would like to make is a quilt with two of my kids walking hand-in-hand with my grandma in a park in San Juan Bautista when they were very young. On my absolute have to make list is a quilt using that picture. I am assuming this is from a picture. I love it it. These men look real. Very nicely done. Love this basket quilt. I could see me doing this one - well that is if I could find someone to do the handles. 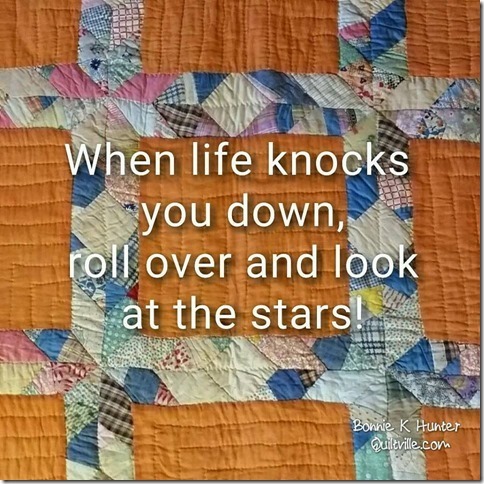 I really like the colors and fabric the quilter used on this quilt. I just ordered a book from Amazon with a pattern a lot like this one in it. I cannot wait to work on it. I love the flowers. I especially love how the border was brought in to match the flowers so well. Beautiful. One of my favorites in the show. On the information card the quilter stated this bee was to go on the back of the graduation quilt she made her son (which was also at the show but I failed to take its picture). 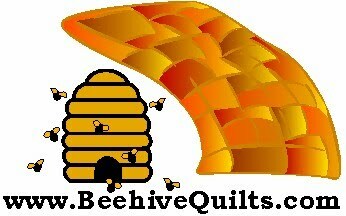 She said the bee was so great that the quilt took on a life of its own. Love it. Go Sacramento State! This pattern is in every show I go to. I want to make it. It would probably take me a few years, but some day maybe mine will be hanging in a quilt show. I'm sorry the picture is not so clear. This quilt is fluid. It is primarily blues with a wavy cut and the quilting adds to the motion. Then, as you can see, there are fish swimming in this ocean. Very large quilt. Very beautiful. Like this. I also like that you can see how the show was set up. Nice and airy. Sometimes quilt shows are put up so close together that it is hard to see the quilts. This year was perfect. Room to see. Room to take pictures of the larger quilts. My obligatory Halloween quilt. Love Halloween quilts. This is embroidered, which makes it even more beautiful in my eyes. A lot of work went into this quilt. I love it. Again this picture is not clear. What I loved most about this quilt, though, is very clear. That's the colors. I love the bright background fabric. I love the vines and flowers around the border. Very, very nice. This was a fun and very nice show. Good job to everyone who submitted quilts. They were all beautiful. Good job to the guild for the fine manner in which it was run. I am glad I was part of it.